I think I have mentioned before that I began my career in foods with the intention of becoming a pastry chef. It was a surprise to me when I ended up loving the savory side of the kitchen enough to make that my career. But I still love to bake. A quick look at the "recipes" page of my blog provides ample evidence of this. I especially love cake and am forever trying new and varied recipes. But no matter what I am baking, often the most difficult thing about preparing a new recipe is determining exactly how much flour the recipe calls for. If you are a professional pastry chef...or a long time, experienced baker...you use a scale when you bake and you were nodding in agreement when you read that last sentence. 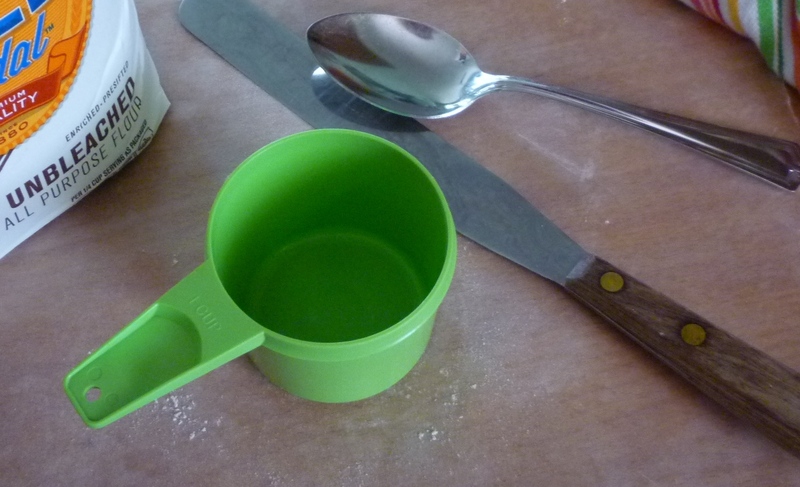 If you use volume measurements (cups and spoons), you might have been scratching your head. A recipe—by definition—with its list of ingredients...and the quantities of those ingredients...will tell you how many cups of flour to use...right? Unfortunately, even if you know the number of cups of flour in a recipe, you will still only have a general idea of how much flour to use. until the flour is mounded up and over the rim. Then she took a palette knife and swept it across the measuring cup to level the flour off even with the rim, with a smooth surface that had no dips or gaps. ...pointing out that if I had tapped or jiggled the cup while I was measuring that I would have packed it and ended up including what might have amounted to another 2 (or more) tablespoons of flour...and then my measurement would be inaccurate and whatever I was making might not turn out right. From that moment on, I was confident that I knew the absolute "correct" way to measure flour. My opinion was reinforced in high school Home Ec class when our teacher taught us the exact same method (although not quite so eloquently as my mother). The first inkling I had that there were other skilled bakers out there who might choose to measure flour in a different way was when I got a copy of Rose Levy Beranbaum's Rose's Christmas Cookies. In her earlier (ground breaking, in my opinion) work, The Cake Bible, she had championed the idea of using a scale to weigh all of your ingredients. But since most Americans still didn't have scales in their kitchens, she helpfully included volume measurements next to the weights. All of the flour measurements in that earlier work had specified that the flour was to be sifted directly into the cup before leveling. In the cookie book though, she specified varying methods of measure...sometimes "lightly spooned and leveled"...but more often than not, "dip and sweep". I have to admit I was mildly appalled that a baker that I had so much respect for was using what I considered to be the "wrong" way to measure flour. For those unfamiliar, the "dip and sweep" method refers to dipping the cup measure deeply into the bag of flour and then leveling it with a palette knife. The fact that Beranbaum took the time to specify method of measure for those who insisted on using volumes rather than weights is a good indication of how different the results of each form of measure can be. The next time I ran into the difficulties of measuring flour by the cup was during my first job in a professional pastry kitchen. Professional kitchens are volatile places. Things must be done quickly and accurately. Lots of yelling and abuse goes on in order to whip young cooks...not used to the fast-paced environment...into shape. The first couple of weeks for me were rather traumatic in that regard. I had a college degree...had been a professional businesswoman for several years...and was not used to an environment where instructions were not given...but not knowing what the instructions were resulted in being yelled at. Furthermore, I had been to cooking school. Consequently, I knew a little...certainly not all that I needed to know to do a job to the specifications of my new boss...but enough so that a small amount of instruction before the fact...as opposed to yelling after the fact....would have been a much better approach. After a couple of weeks of this, my boss gave me a recipe I think she thought I couldn't screw up...chocolate chip cookies. Of course I had made chocolate chip cookies many times, so I thought this was one task that wouldn't result in a put-down. But...I was wrong. I had never made a recipe so large before... It called for 16 cups of flour. Most of the restaurant's recipes were in weights (which is something I had become familiar with in cooking school in England....where—like the rest of the world—all baking is done by weight)...but still in many American restaurant kitchens, a few recipes remain that are recorded in volumes...just because no one has ever bothered to convert them to weights. This was one of those recipes. Armed with the recipe, I began to hunt around for a measuring cup.... When I finally located one I began to carefully spoon, level....and count. It was at some point during this operation that the pastry chef walked in. She stopped to absorb what she saw and barked "WHAT are you doing?!" At a bit of a loss, I replied...."ummm...measuring flour...." With great disgust, she dumped my flour back into the bin and said "That's not how you measure flour!" She then grabbed a gallon-sized liquid pitcher, swept it through the flour bin and roughly and vigorously shook it to "level" it off and then banged it down on the counter and said "THAT'S 16 cups of flour!" As she left the room and I stared at the pitcher of flour I realized that whatever the amount of flour in it happened to be, it was probably not 16 cups...whatever that meant.... It was however what was always used in that particular recipe...and it produced the same results every time. But if you were to hand that recipe to a dozen different people...they would produce widely varying results...probably none of which would match the cookies that we made at the restaurant. I share all of this not because I wish to criticize my first boss. She was a wonderful woman (ultimately we became good friends) and a very talented pastry chef (I learned a ton from her). Rather, I share it to illustrate my contention that there is no agreed upon standard in this country...where volume measures are the standard...for what actually constitutes a cup of flour. Unless you know two things—where the recipe came from (i.e. who developed it) and how they measure flour—knowing that a recipe calls for, say, 2 cups of flour, gives you nothing but a starting point. I have been thinking about all of this more than usual recently because of an article sent to me by my sister-in-law. It is a discussion of this difficulty of deciphering what is meant by a cup of flour. It is a very interesting history and it also includes a list of well-known pastry chefs and cookbook authors and how each of them measures flour. My sister-in-law—who is an avid baker—was fascinated because she always uses cups and spoons and had never considered getting a scale. I was pleased to see a pet peeve of mine discussed so well...and interested to see how attached each chef/baker was to their "correct" way of measuring flour. Mostly I was excited to find a list that revealed the favored method of all of these well-known recipe developers...this is pretty much a gold mine because having this bit of information is the key to executing the recipes of each well. Perhaps you think the method of measure cannot really make such a great difference. But I assure you, it can make a very great difference: the difference between success and failure. When I measure a cup of flour the way I was taught by my mother all of those years ago (lightly spooned and leveled), I get 4 to 4 1/4 ounces or 115 to 120 grams of flour. Dipping and sweeping will produce anywhere from 130 to 140 grams...depending on whether I have stirred the flour first to aerate it a bit. If—as is practiced in some production environments—I sweep the cup through the container and "level" it by pressing it against the side of the flour bin, I will get in excess of 150 grams...possibly as much as 160 grams of flour. Now let's suppose that a recipe calls for 2 cups of unbleached all-purpose flour. This is the type of flour I almost always use and two cups of flour would be a normal amount of flour for a small cake. If I make that cake in my kitchen (spooning and leveling the flour), I will use 230 grams of flour. But if a dip and sweeper makes that cake, they will measure out closer to 280 grams of flour. This 50 gram difference is not insignificant (for a visual, that's anywhere from a third to a scant half of a cup of flour). If you happen to measure by dipping and pressing against the side (or shaking vigorously as in my chocolate chip example), 2 cups will yield over 300 grams of flour...or thirty percent more flour than I would get spooning and leveling. And this is just a small recipe. Imagine the difference it would make for my large chocolate chip cookie recipe. If the recipe were written by someone who intends 300 grams of flour and I only use 230 grams, my cake will be wet, porous...and probably over-leavened...basically an inedible flop. If however the recipe were written by someone who intended 2 cups to be 230 grams...and my method of measure yields 300...the cake will be dry, crumbly, under-leavened and tough. I am convinced that many baking failures are caused by this one crucial difference in baking habits. 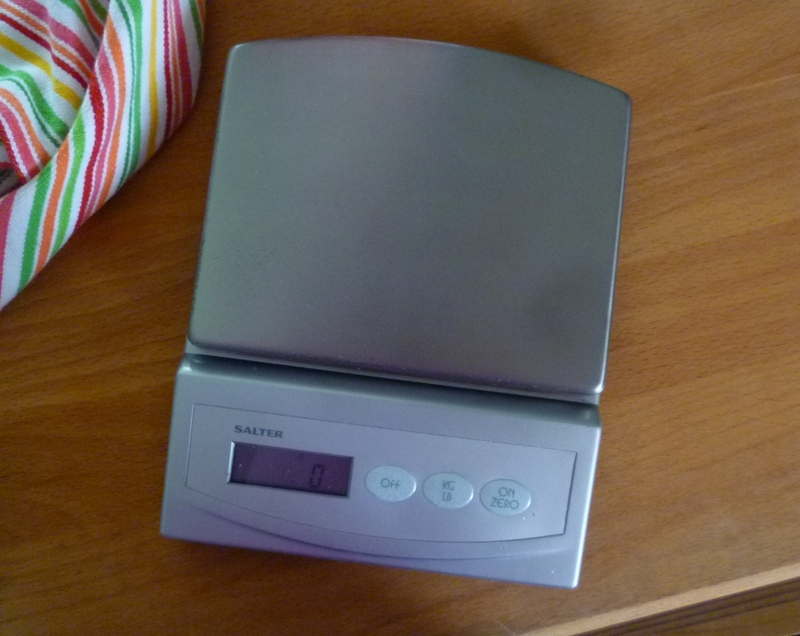 The moral of course is to get a scale....and start weighing your flour. Convert your recipes (i.e. 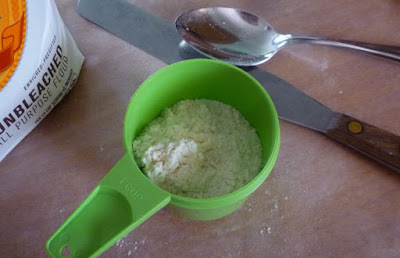 weigh a cup of flour as YOU measure it and then use that weight whenever you make your old favorites). Then, seek out recipes that give the ingredients in weights rather than volume. Unfortunately most cookbooks in this country are still written using volume measures. So, when you get a new cookbook, look to see if the author defines somewhere how they measure flour (most good bakers and pastry chefs will do this for you in the intro/basics section). You can then measure out a cup of flour following their method, weigh it and then make a note of whatever that weight is in the front of the book. In my experience, cookbooks produced by "famous" restaurant chefs, don't always tell you how they measure a cup of flour. But, like the restaurant I started out in, they tend to use a heavy cup of flour...140 grams per cup or more. I have been pleased in recent years to see that more and more recipes are found in weights. I am guessing that this is due to the proliferation of food blogs which tend to have international audiences. And as I already mentioned in passing, the rest of the baking world uses weights rather than volume measures for baking. Hopefully someday soon all American cookbooks will list all ingredients by weight. Until then, a google search or two will often provide the key to how a particular baker measures...or even provide an exact weight per cup equivalent. If you have hung in there for my whole post....which is actually a bit of a rant, I admit....thank you! I actually am going to share a couple of delicious cake recipes...both of which were partly responsible for bringing this issue of the weight of a cup of flour to the forefront of my mind. For the first cake I am only going to provide a link since I made no changes to it. 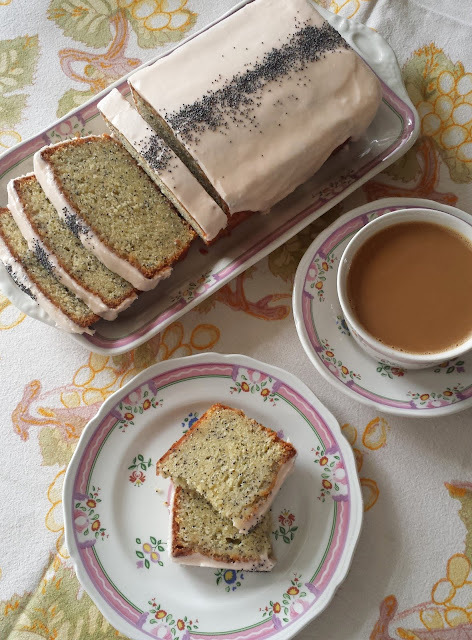 It is a recipe by Gina DePalma (pastry chef at Babbo) for zucchini cake. I found the recipe on David Lebovitz's site. His recipe included weights (as they always do). I had been having a great deal of difficulty finding a zucchini cake (for an upcoming class) that I was happy with. I knew part of the problem was that I couldn't find a recipe written in weights. This particular recipe called for "2 cups (280 grams)" of flour. This told me that Lebovitz (or DePalma) uses a 140 gram cup (dip and sweep)...and I would have produced an inferior cake with my 115 gram cup. I am happy to report that this is the finest zucchini cake I have ever tasted. If you like spicy vegetable-based cakes, you should definitely give it a try. The second cake is a recipe from a local pastry chef. 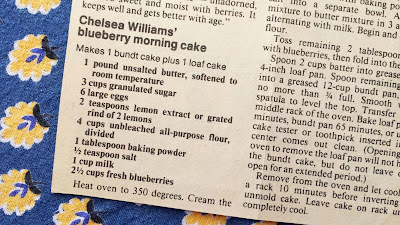 Long before I went to cooking school I had heard of Chelsea Williams...she was well known around town for her delicious baked goods...which is probably why I had clipped a recipe out of our local paper for one of her cakes. It was called "Blueberry Morning Cake". For some reason I never made the cake and the recipe disappeared into my recipe file. Many years later, after I had been working in the industry for several years, I finally met Chelsea. We have gradually gotten to know one another better over the years as our paths have continued to cross. When I happened upon the recipe for her cake in my recipe file, I snapped a photo of it and messaged it to her. She said it was one of her all time favorite cakes and wanted to know if I had ever made it. 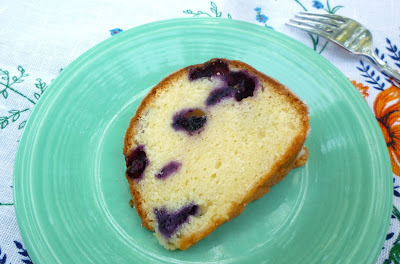 I had not...but since we are in the middle of blueberry season I decided that I would do it now....before it fell off my radar again and slipped into the back of my recipe file once more. Because Chelsea is a professional baker...and in my experience most restaurant and bake shop pastry chefs use a heavier cup...I decided to ask her how she measured her flour. I was so glad I did! First of all, we had a fascinating conversation...pretty much along the lines of the things I have already written. Secondly, I found out that she is a dip and sweeper (and is just as attached to her method as I am to mine) and that her recipes are scaled to 140 grams per cup. Had I made her cake the way I scale recipes, I would have used a 115 gram cup. Her recipe (in its original form...I'm posting a smaller quantity) called for 4 cups of flour.... The difference in my method would have produced a cake that was nothing like hers. When made with the proper amount of flour, the cake is moist...with a nice fine, even grain...and blueberries that are suspended beautifully throughout. 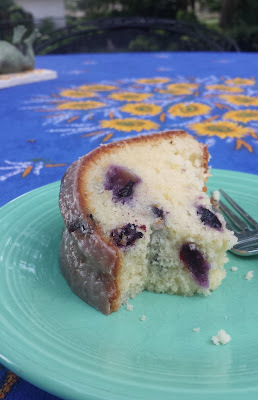 A substantially smaller amount of flour would have meant a wet, uneven crumb and the blueberries would have gravitated to the bottom of the pan where they would have become a wet glob..... Not very nice at all. As I mentioned, Chelsea's original cake was a much larger batch. It made a large bundt cake and a loaf cake. Since I only wanted to make a bundt cake, I made just 2/3 of her original recipe...which is how I'm passing it on to you. 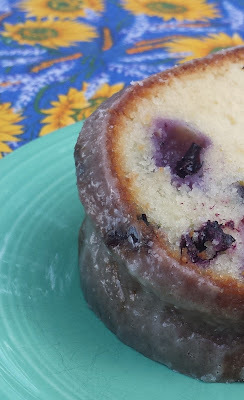 If you want to make the bundt and the loaf, simply increase my recipe by 50 percent. Finally, since I had just made the zucchini cake...with its delicious "crunchy lemon glaze"...I made a spur of the moment decision while Chelsea's cake was baking to give it the same lemon glaze. It was very good...but it is not a part of the original recipe and I know the cake will be delicious without it. 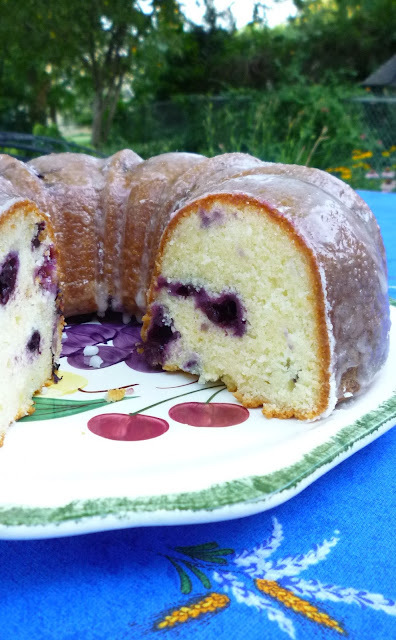 With or without the glaze it is a very moist cake...a pound cake of sorts...and like pound cake-style cakes seems to get better (moister, with a more developed flavor) as it sits. Although...as I reported back to Chelsea...it's so good, I'm not sure it will ever last that long at my house. carefully folding until the blueberries are evenly distributed and the dry ingredients are completely incorporated. Transfer the batter to a greased and floured 12-cup bundt pan. Use a spatula to smooth the top. Bake the cake in a 350° until golden and a toothpick inserted in the center comes out clean—about 55 to 65 minutes. If making the glaze, during the last few minutes of baking, whisk together the lemon juice, 1/3 cup (65g) granulated sugar, and powdered sugar. Let the cake cool for 10 minutes, then carefully invert it onto a cooling rack. Brush the glaze over the cake with a pastry brush and let the cake cool completely. Chelsea's original recipe did not include a glaze and used milk instead of yogurt. The cake may also be baked in two loaf pans. Chelsea's original recipe was for half again as much batter (1 lb of butter...6 eggs...etc.). She divided the batter between the bundt pan and one loaf pan.